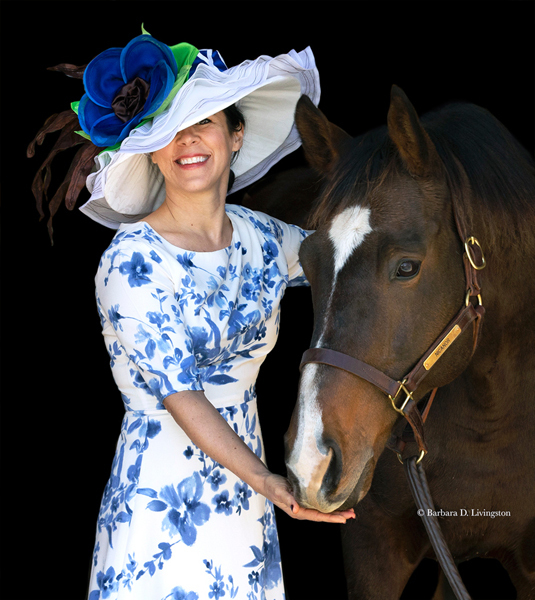 For the tenth consecutive year, MAGGIE MAE DESIGNS® of Cape Cod and Old Friends of Kentucky are teaming up again for an unparalleled online shopping experience that began January 1st with their "Hats Off to the Horses: The Road to the Derby" auction. 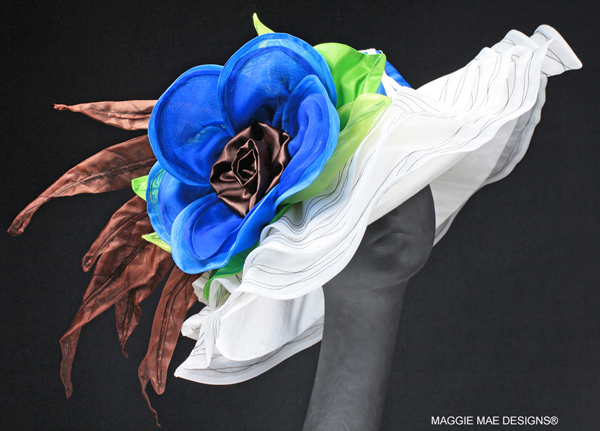 This unique Derby hat fundraiser is an annual event which features one-of-a-kind couture Derby hats created and donated by couture milliner Sally Faith Steinmann of MAGGIE MAE DESIGNS® to benefit the retired racehorses of Old Friends. 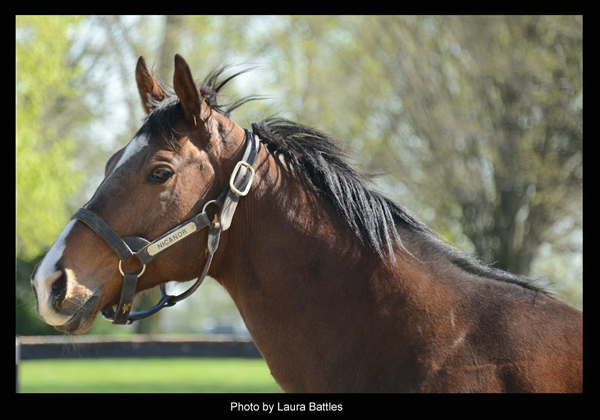 The fourth and final hat up for bid in our 2019 Hats Off to the Horses auction series for Old Friends honors Nicanor, a stakes-placed runner, sire, and full brother to Kentucky Derby winner Barbaro. 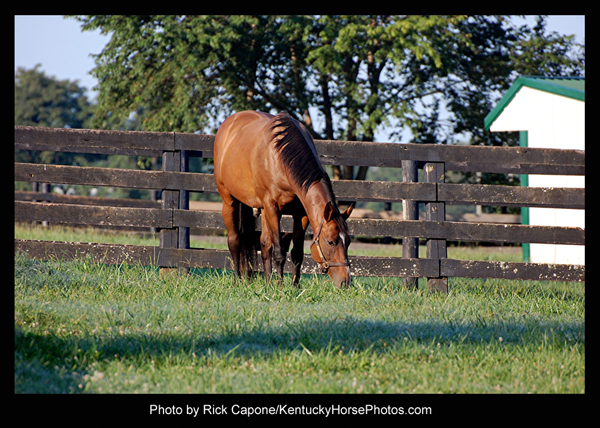 Nicanor was pensioned from stud duty at Shamrock Farm, Maryland in the spring of 2018 and retired by owners Mr. & Mrs. M. Roy Jackson of Lael Stables shortly thereafter to Old Friends. 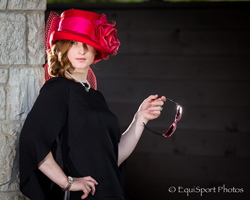 The “Nicanor” chapeau is up for bid from April 1st through the 11th. All proceeds from the sale go to Old Friends Thoroughbred Retirement. Special thanks to retired jockey Joe Steiner and his wife, artist Dagmar Galleithner-Steiner for helping us with this year's “Hats Off to the Horses” fundraiser that supports the retired racehorses of Old Friends Thoroughbred Retirement in Kentucky. Thanks also to chief photographer for Daily Racing Form and 6-time Eclipse Award winner, Barbara D. Livingston for her stunning images. When I asked Michael Blowen, President and founder of Old Friends, his impression of Nicanor he responded, "Nicanor and I have a lot in common. 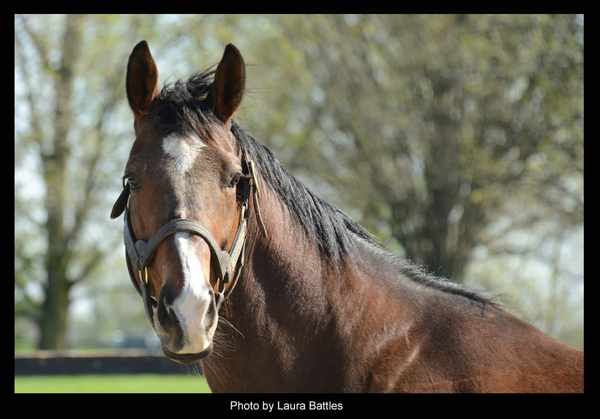 His brother, Barbaro, is like my sister, Pat - more talented, smarter, prettier and wealthier than her sibling. Sally's Nicanor chapeau captures the inner beauty of our wonderful retiree. Now, thanks to the generosity of Roy and Gretchen Jackson, Nicanor receives the daily accolades he so richly deserves. Eventually, I'll catch up." Clearly, a very special hat was needed to honor this charming new retiree of Old Friends. 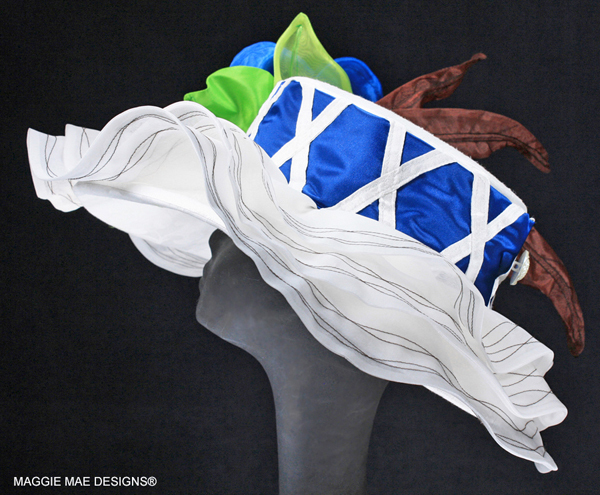 The resulting hat design showcases Nicanor's beautiful bay coat, his Lael Stables racing silk colors of blue, lime green and white, along with his bold spirit and athleticism. 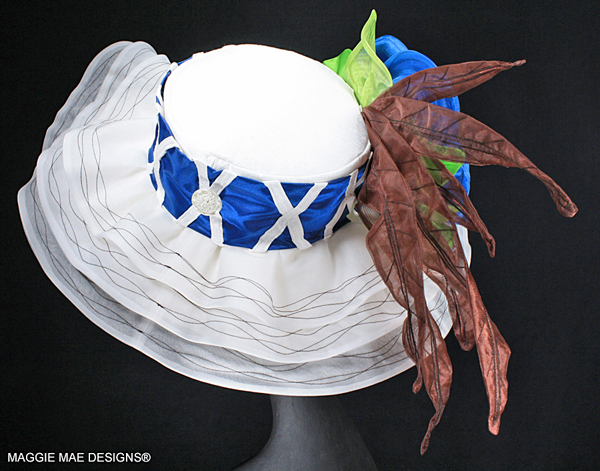 To honor this athlete, the distinctive blue, lime and white racing silks of owner Lael Stables racing stable provided the primary color inspiration for the trimmings of this stunning Derby hat and are the recurring theme throughout the design. 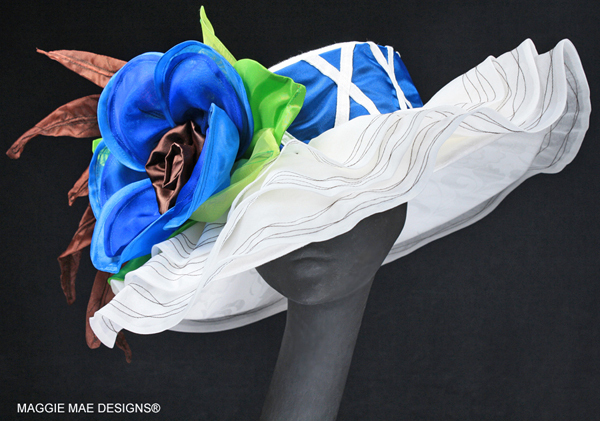 A hat foundation was created using a base layer of white dupioni silk overlaid with three wavy layers of white silk organza top stitched with chocolate thread that spill over the edge of the brim and extend the overall length of the hat to nearly 21 inches. A white brocade underbrim creates a soft, elegant effect when the wearer's face is upturned. 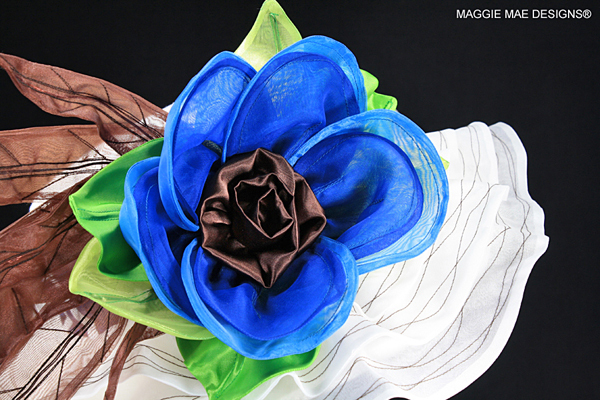 To showcase Nicanor's stable colors, a large 2-tone blue silk organza double petaled Marguerite fleur with a chocolate rose curl center adorns the front of the hat. 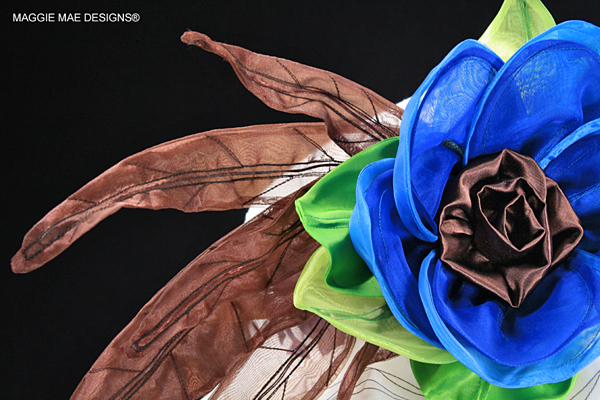 A medley of lime organza and taffeta leaves was created to frame the rose. The Marguerite was then framed with a medley of brown organza “feathers” topstitched in black thread to emphasize Nicanor's bay coat. As you can see, the hat is stunning from every angle! 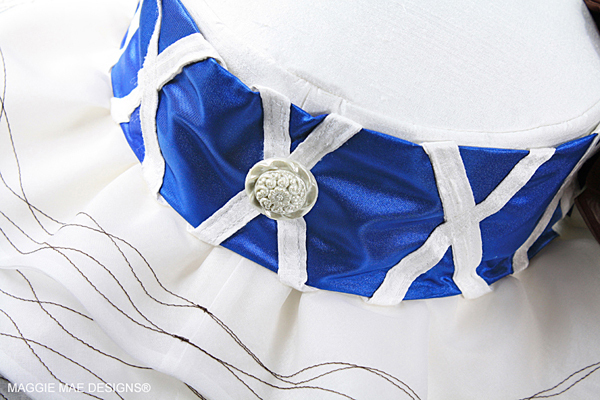 A crisscross pattern sash honoring the racing silks of Lael Stables was created out of deep blue satin with white dupioni silk “crosses” to encircle the crown of the hat. A white pebble button was added to the back of the hat for the finishing touch. The lining for the “Nicanor” hat was created from a white brocade to coordinate with the trims. As a physical remembrance of Nicanor, several strands of his tail hair were braided and woven into the trim of the hat, creating a unique, one-of-a-kind Derby chapeau that captures Nicanor not only in spirit but in substance as well. 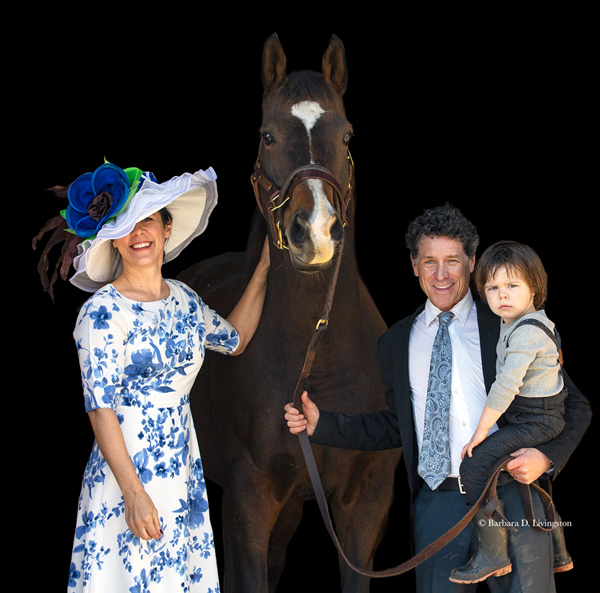 The purpose of this amazing millinery delight is to honor the life of Nicanor and all of the horses who, thanks to the generosity of those who support their aftercare, now graze in the warm sunshine of Dream Chase Farm for the rest of their lives. Hats Off to you, Nicanor! 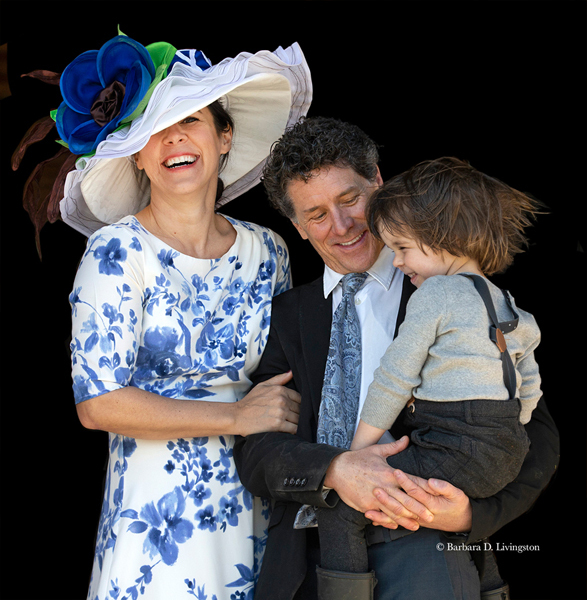 All proceeds from the sale of the “Nicanor” hat go to Old Friends. 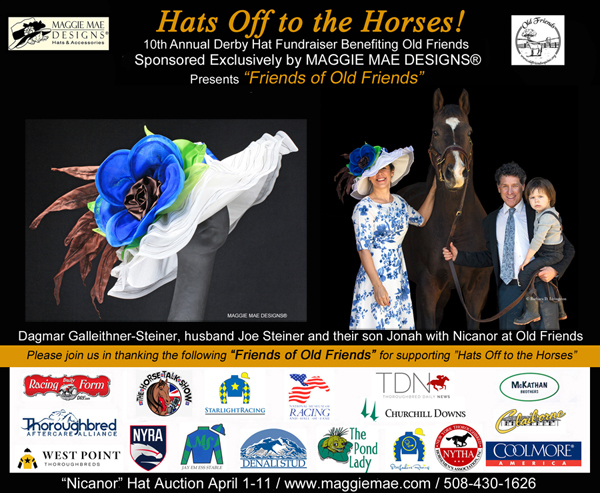 Special thanks to retired jockey Joe Steiner and his wife artist Dagmar Galleithner-Steiner for helping us with this year's “Hats Off to the Horses” fundraiser that supports the retired racehorses of Old Friends Thoroughbred Retirement in Kentucky. The Official Poster that will be shared by all of the “Friends of Old Friends” during our auction of the “Nicanor” chapeau. To read more about Nicanor, the horse, please click on the following link - Featured Horse. Bid as many times and on as many hats as you like during this running auction. For further information about the eBay bidding process, please contact Old Friends at 502-863-1775. If you don't desire to place a bid on a hat, please contact Old Friends to see about what other ways you might be able to help out at Dream Chase Farm. Freight charges will be at the expense of the winning bidder. Winning bidders, please allow 3-4 weeks for delivery of your hat in order to ensure proper sizing. 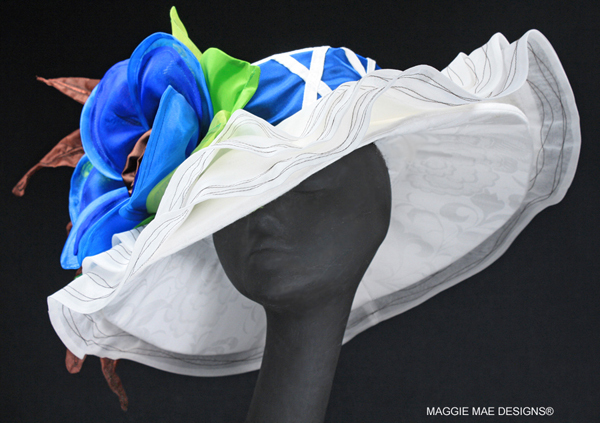 To view the couture Derby hats from previous auctions, please click on the following - Old Friends Hat Auction Portfolio. 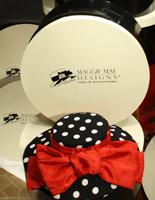 Custom hatboxes for your auction hats! 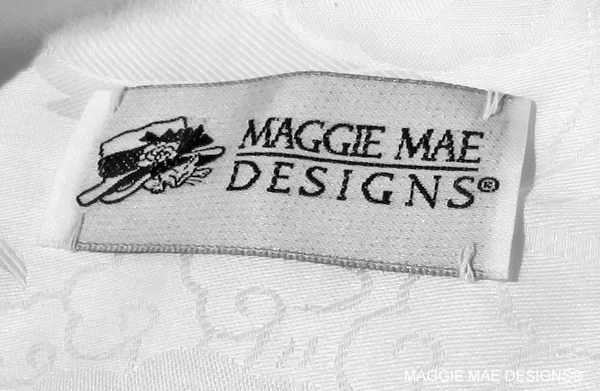 All winning bidders' hats are shipped to them in custom MAGGIE MAE DESIGNS® hatboxes for storage.